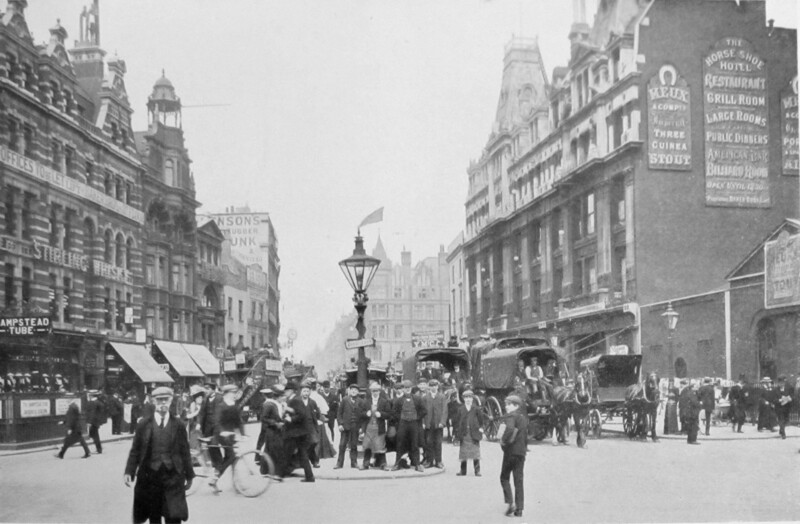 Tottenham Court Road, south from Goodge Street . 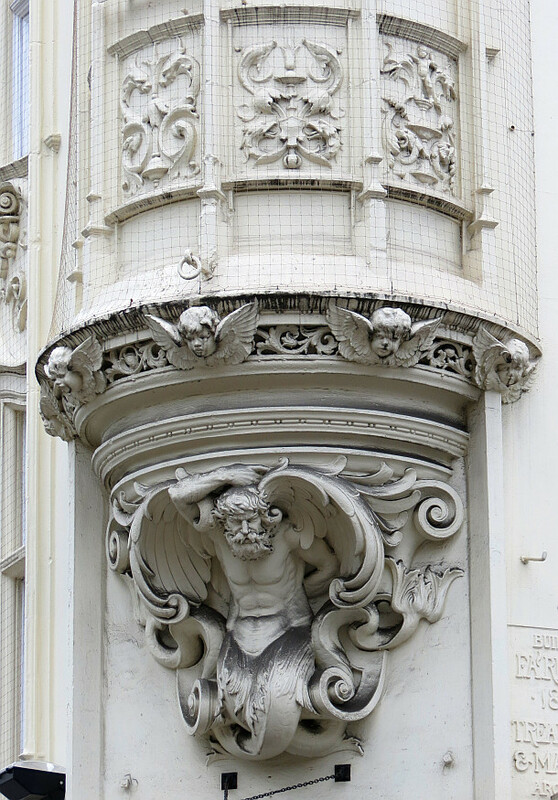 I would not suggest a visitor make a special trip to Tottenham Court Road to see sculpture, but for those who go there for shopping – it is an interesting, gritty street in an interesting area of London – then this page notes what sculptural interest I have come across. Along the way, we can at least see some minor architectural ornament, see one finely decorated tavern, and mourn the loss of a finer one, see where one eminent sculptor lived, and fail to see where another was buried, drift down a couple of side streets to see at least one proper statue and one excellent decorated building, and can take in a London Square near each end. 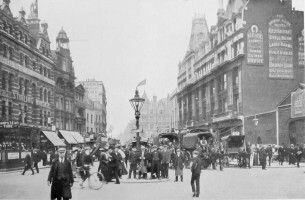 Southern entry to Tottenham Court Road, and cupola seen on left of picture . We start at the south end, by Centre Point, a landmark tower, at the corner with Oxford Street (see picture at top of page, where it closes off the view). At this end, the first blocks reflect the architectures of Oxford Street (see this page). Thus the first block of offices on the left is a Queen Anne style building of the type found in some numbers along Oxford Street, and feels like a continuation of the Tottenham pub going round the corner rather than something belonging to Tottenham Court Road. 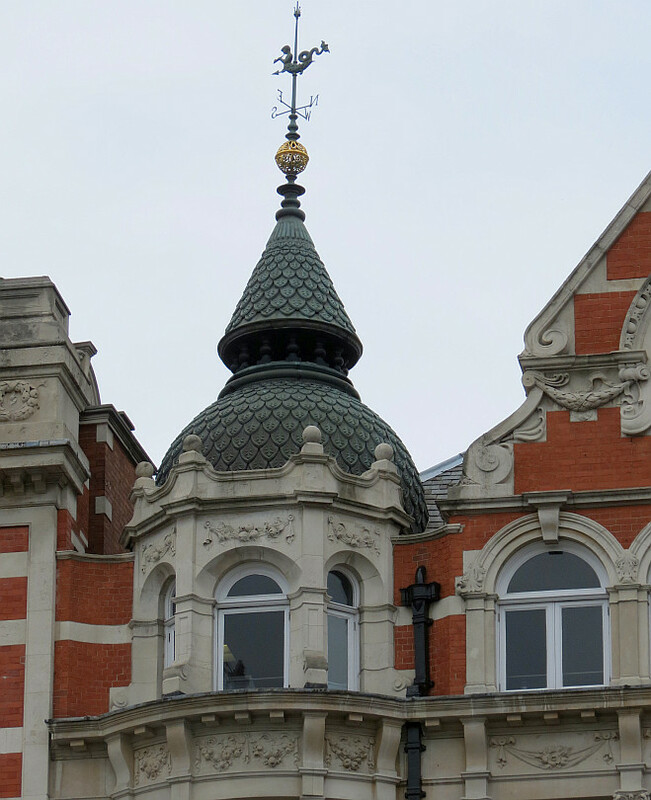 The next building on that side, two bays wide, has a nice cupola with gold-painted dome on delicate iron pillars. 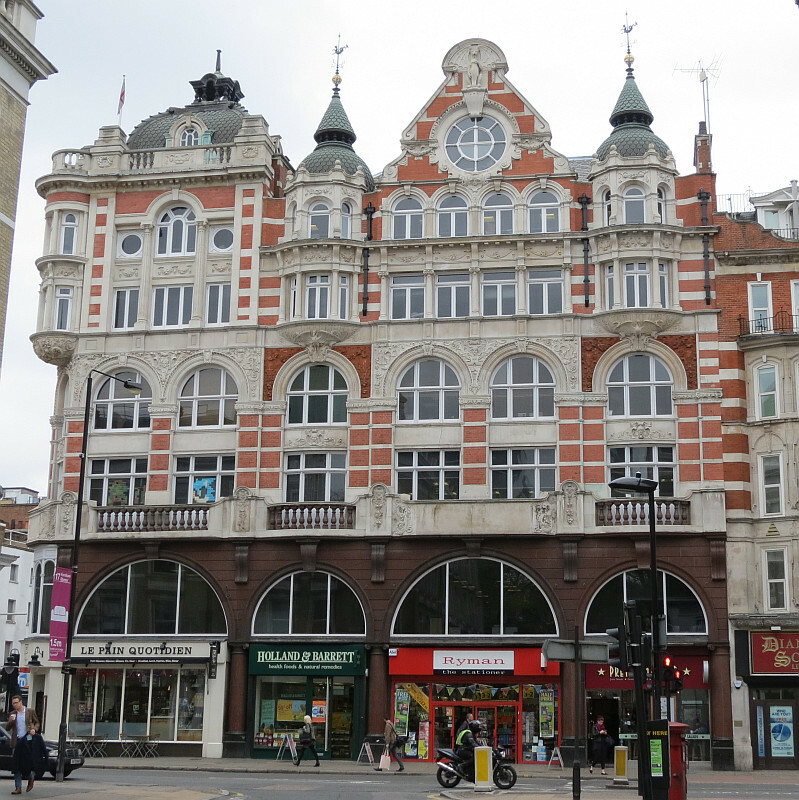 And the building next along, Edwardian Classical coated in white tile, with tall first floor, central attached Corinthian pillars supporting a broken, open pediment with cartouche in the centre, and much ironwork, also hearkens to an Edwardian type found on Oxford Street. 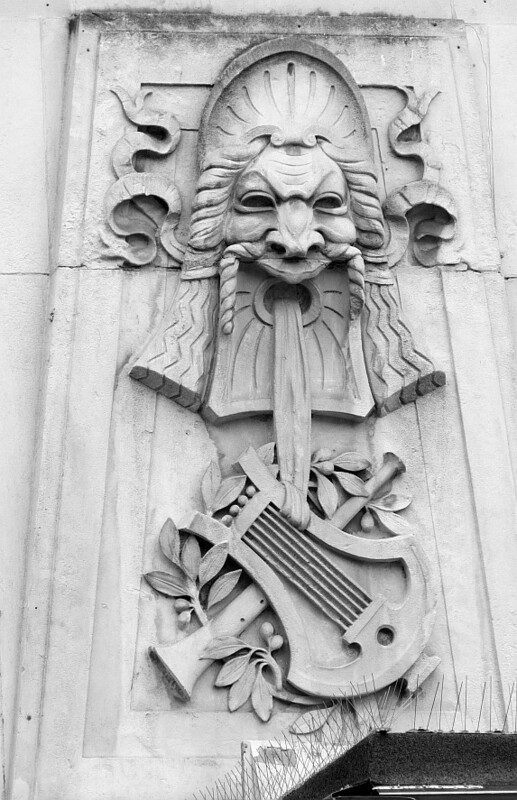 Sculpted masks of Comedy and Tragedy, Dominion Theatre . 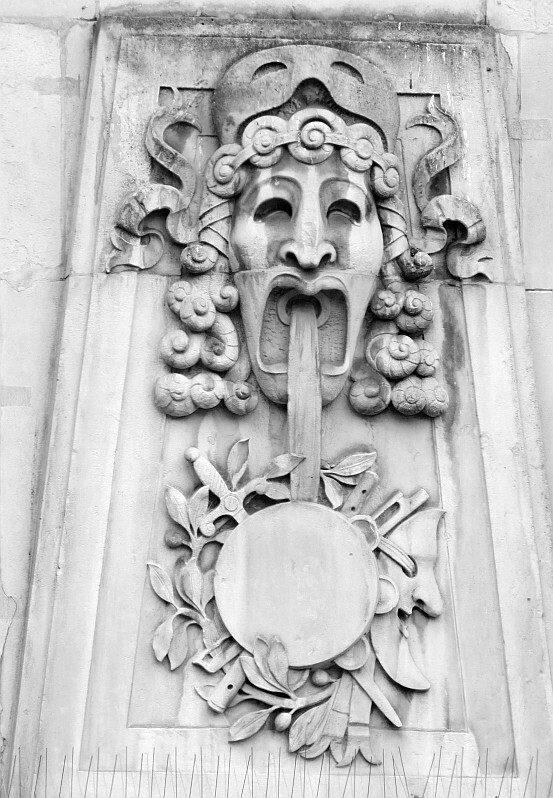 Opposite, on the right hand side the white stone corner block is very Oxford Streetish, and the Dominion Theatre next to it has a bit of sculptural decoration in the shape of two masks of Tragedy and Comedy , very large of the type (more allegorical representations of Tragedy on this page). 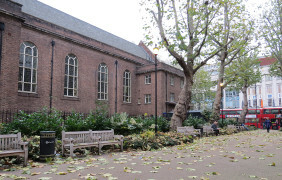 The first corner on that side is to Great Russell Street, which leads through to the British Museum, via an ugly building for the Trade Union Congress with a late 1950s statue by Bernard Meadows in front representing The Spirit of Brotherhood ; there is a courtyard within which contains a work by Epstein. 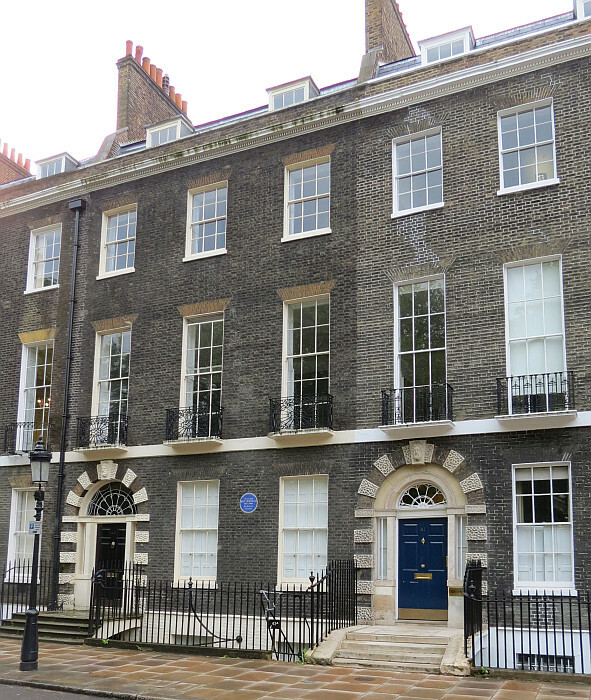 Bedford Square: Butterfield's house, a portico, and a Coade Stone head . After the initial blocks, Tottenham Court Road is modern for a little way, square blocky things still housing sound equipment stores, but with the electronics and computing shops once so familiar at this end of the street recently disappearing rapidly. 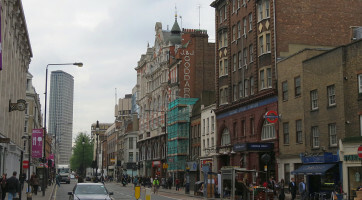 Abruptly , on the right hand side is a pub, no.236 Tottenham Court Road , within an early 19th Century building of four storeys plus a balustrade plus dormers, darkened yellowish brick with white painted edgings to the windows, ornamented string courses (horizontal lines) and keystones to the arched windows, and something of a feature of the corner. There are six bays to Tottenham Court Road, then the angled corner with the main entrance, and a full dozen bays to Bayley Street round the corner. 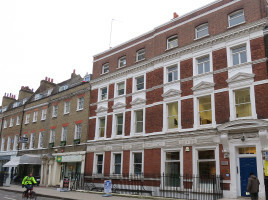 It is worth a detour down Bayley Street – a few paces, and we are passing a terrace of uniform houses, three storey plus dormer, again darkened brick with white painted windows, rectangular now, and the distinctive feature, arched doors with alternate brick and white-painted segments all the way round, including a keystone head at the top of each doorway (see this page for examples of keystones). A few paces further, and we are in Bedford Square, a complete Georgian Square of such buildings. 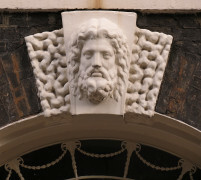 The buildings were put up in about 1775-80, and the keystone heads are the work of the Coade manufactury – such Coade Stone heads are still found in many places across the country. There centre of the Square is fenced off for the residents, and there are no statues – although the Square is named after the Duke of Bedford, who was the landowner, his statue is in the larger Russell Square. 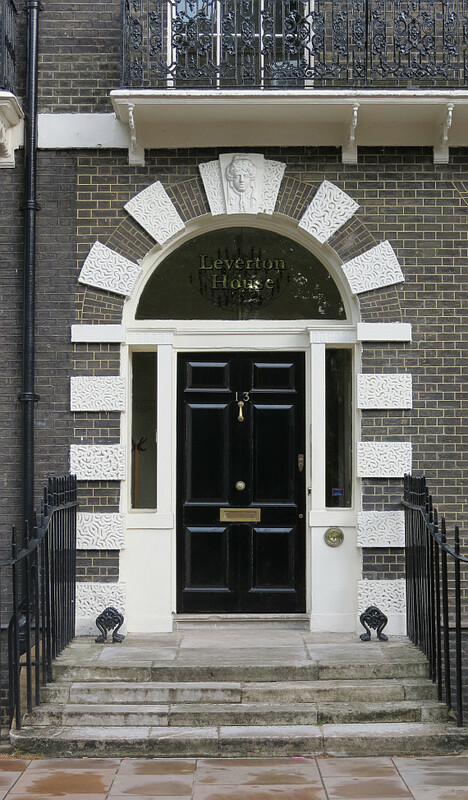 Pevsner suggests the architect of Bedford Square was probably Thomas Leverton, who himself lived at no. 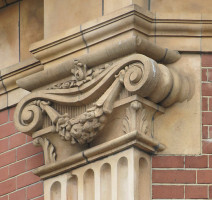 1; the Adams brothers designed the central houses in each side, which are typical of their work, with flat pilasters, and pediments containing lightly carved circles with floral festoons. Around the Square there are many blue plaques indicating the famous people who lived in the various houses, and of interest to these pages, the architect William Butterfield, who specialised in polychromatic decorated Gothic buildings, lived at no.42 from 1886 to the turn of the century. Percy Street, home of John Bacon RA (and Peter de Wint) . 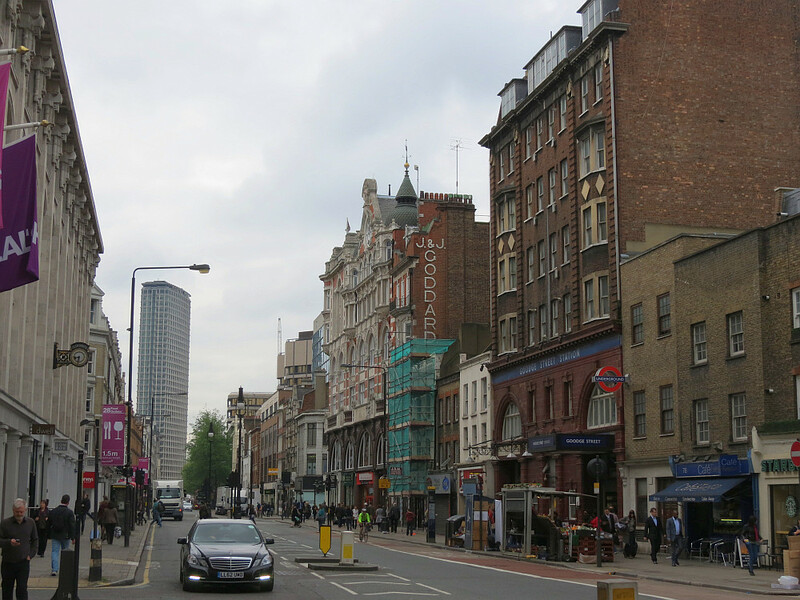 To return to Tottenham Court Road, almost opposite Bayley Street is Percy Street, on the left hand side. On the corner to the main road are two much older buildings, nos. 37 and 38 Tottenham Court Road, rather humble, but indicating some history. Indeed there is. In the late 1830s, a certain John Tallis published a series of street views of London, remarkable in that they depicted, albeit in the simplest form, every single building on the 60-70 streets covered – sort of a Google Earth for the commencement of the Victorian period. 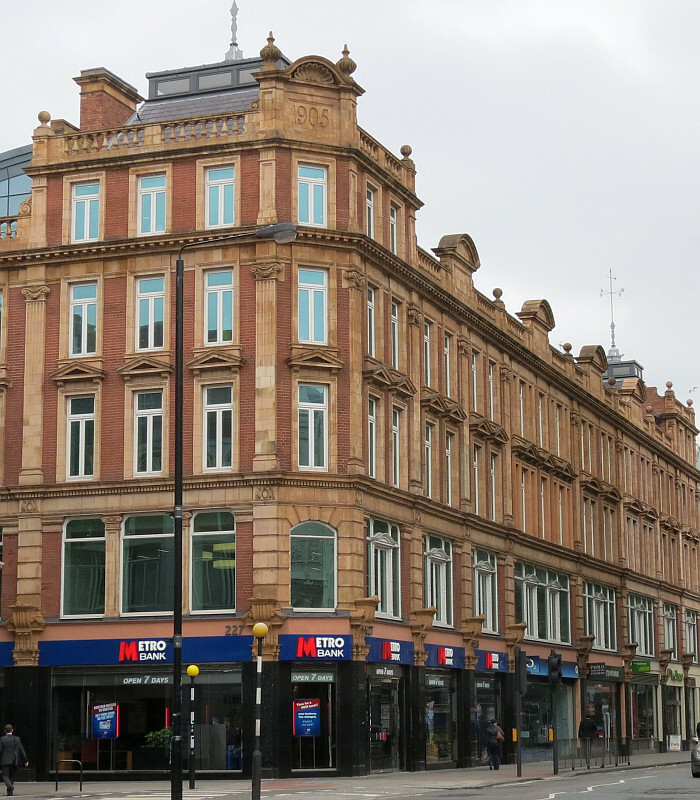 I spent an entertaining half hour walking along matching existing buildings to those on Tallis’s views of Tottenham Court Road. In all, there are about 15, of which nos. 37 and 38 are the first, then nos. 47, 48 and 50, then 69-71, 75-7, 79, 108 or 9, and 117-8; all these are on the left hand side as we go north. Tallis also recorded the shopowners at the time, and we find that 37 and 38 were a milliner and silk mercer; the other survivors include a tailor, engraver, coach builder, stationer, confectioner, brazier, sellers of foodstuffs, linen drapers and a hatter – indicative of the mostly day-to-day merchandise sold on Tottenham Court Road, as opposed to the more opulent wares of Oxford Street. Various of the side streets contain more survivals from an earlier period, and Percy Street, just here, contains a whole row on the south side, dating in fact from as early as the 1760s, some seemingly unaltered. It is worth looking at them to familiarise the eye with the type – two storeys above the ground floor, the upper storey being noticeably lower in height, and dormer windows above; all in brick, the rectangular windows with little Georgian panes, the surviving doorways being arched, with semicircular lights above the door, and sometimes an upper pediment supported on brackets and perhaps pilasters. An important sculptor, E. H. Baily, who sculpted Nelson for the Column in Trafalgar Square, lived at no. 8 in the latter 1820s, and from 1830 – 46 was at no. 10 Percy Street, where the painters Peter de Wint and William Hilton had previously lived. 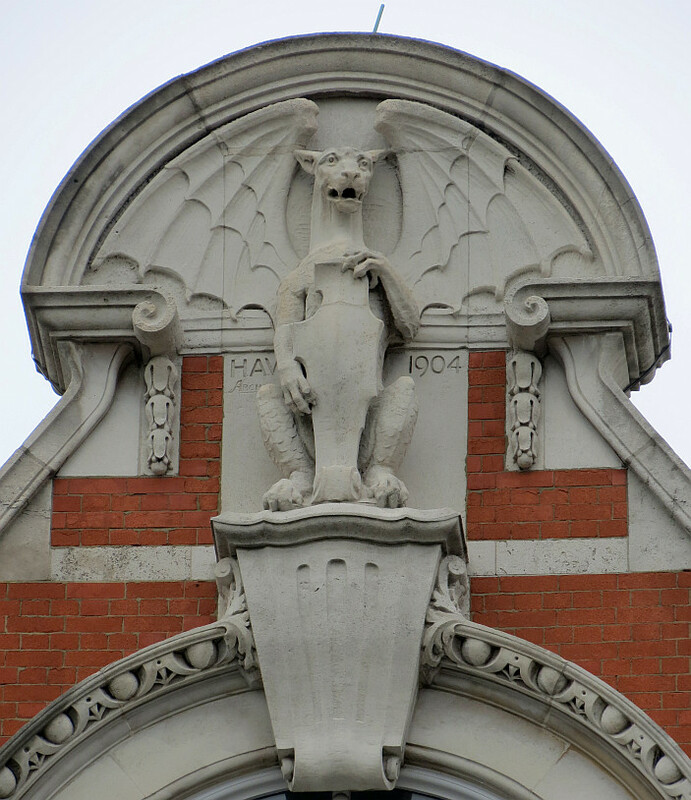 Arts and Crafts terra cotta, no 227 Tottenham Court Road, and Rising Sun pub . Retracing our steps back from Percy Street and continuing north up Tottenham Court Road, the greater part of the long block to the right is occupied by an Arts and Crafts era building in brick and pale terra cotta, with minor modelling of the pillar capitals to the first floor, continuing to become leafy protruding brackets supporting nothing, and further minor décor up above; there is a balustrade at the top, and an elevated corner, now with a modern protrusion behind it, with a pretty little pediment containing a shell and with vases at the sides, bearing the date of the building, 1905. 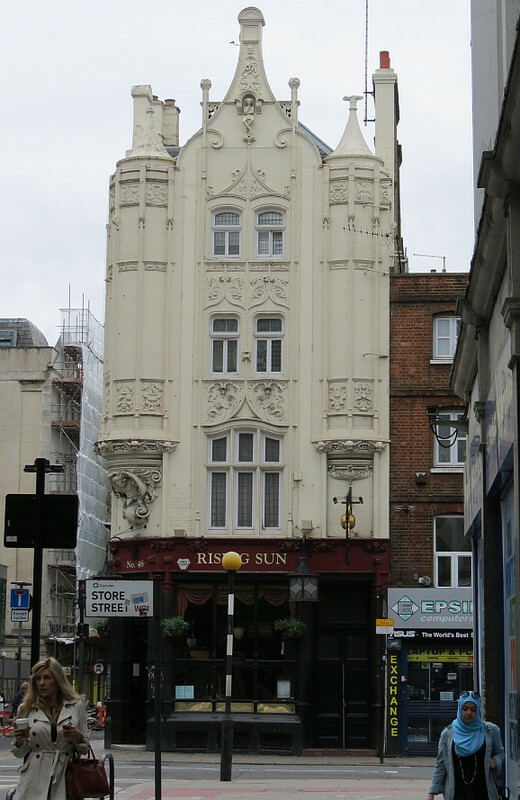 Diagonally opposite this, on the corner to Windmill Street, is the Rising Sun tavern, no.46 Tottenham Court Road, an light-hearted decorated building with round corner tower, Ogee-gable, and sculptural decoration. 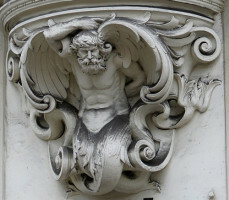 The principle sculpture is the supporting Atlantes to the corner turret, a heavily bearded, twin-tailed merman, but winged (there are pages on this site on Caryatids and Atlantes, and on Mermen); and high above the road on the principle frontage, thus within the gable, an elfin figure, slender, with pointed ears, seated cross-legged on a high stool, arms half-folded so he can lean on one elbow. 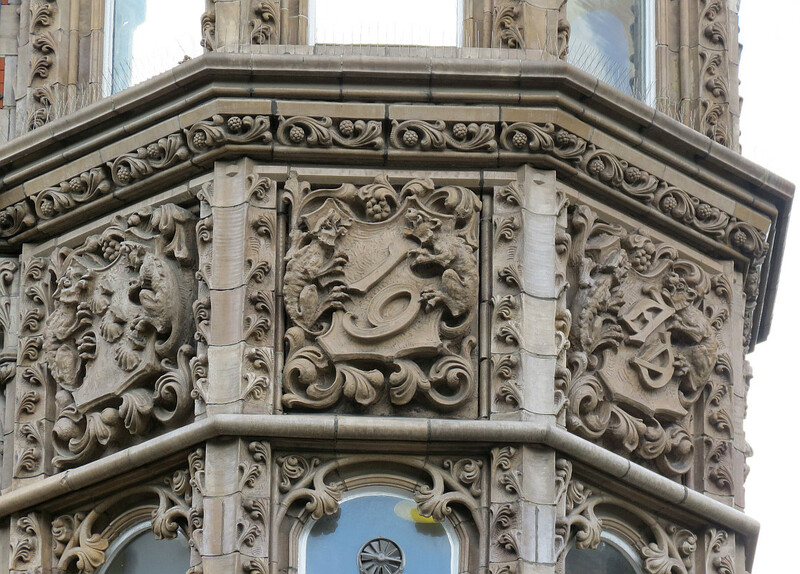 There are other details – Acanthus leaves, winged cherubic heads (see this page if you like such things), and panels bearing grotesques. All thickly covered in white paint, who knows how many layers, so we cannot say what is the material underneath. The date, unsurprisingly, is 1897. Next to it, three more of the early buildings with dormers, interrupted by a more recent addition. 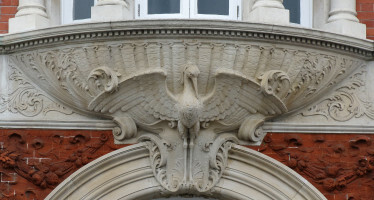 64-67 Tottenham Court Road, Queen Anne style decoration . 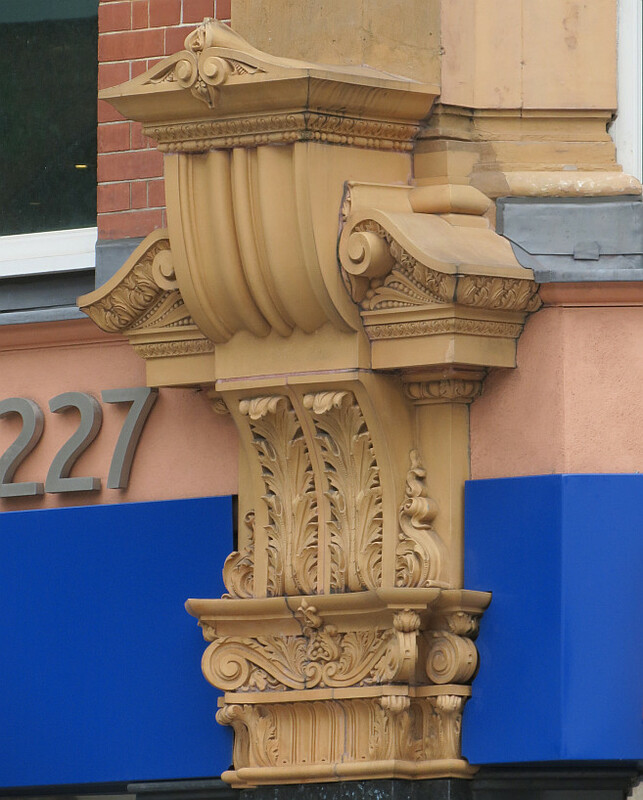 Opposite and onwards, there are more terra cotta efforts on the right hand side, loosely Queen Anne style: Nos. 224-227 by Store Street has brick panels with cartouches and portrait heads in relief, and the whole range has various interesting little roofs and windvanes to enliven the skyline. On the opposite side, by Goodge Street, No. 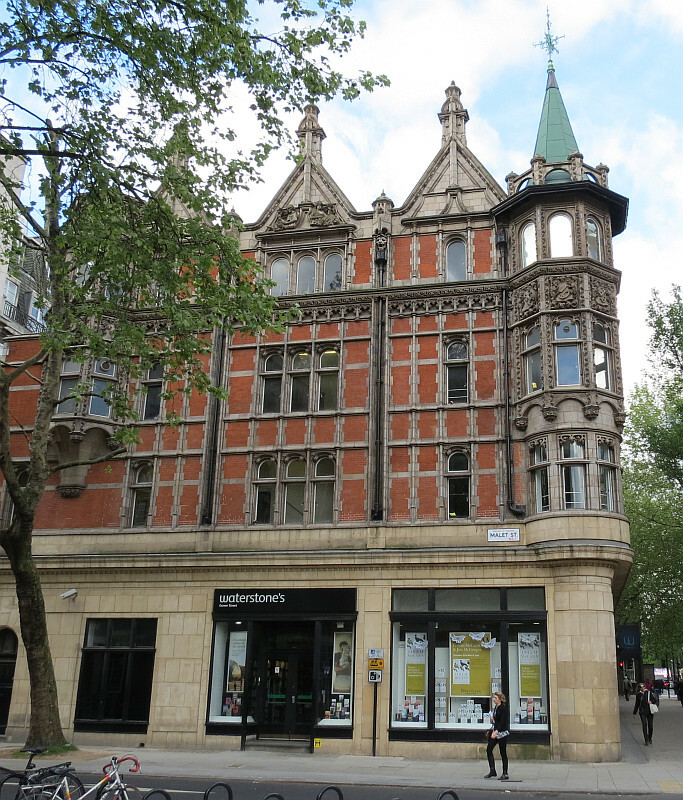 94 Tottenham Court Road is more lively Queen Anne, and intended as a match for the grander building on the opposite corner to Goodge Street. That building, Nos. 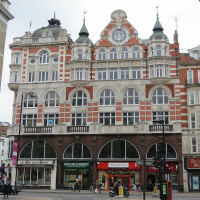 64-67 Tottenham Court Road, is extravagantly Renaissance – a pair of little turrets with whimsical spiky domes flanking a gable face Chenies Street on the opposite side; a further corner turret with French domed roof above, balconies and a balustrade, and a rich coating of low relief decoration. 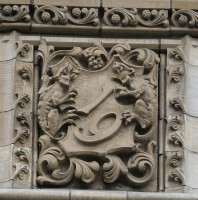 This includes leafy spandrels, faces in cartouches, fruits in bunches and festoons, and shells. 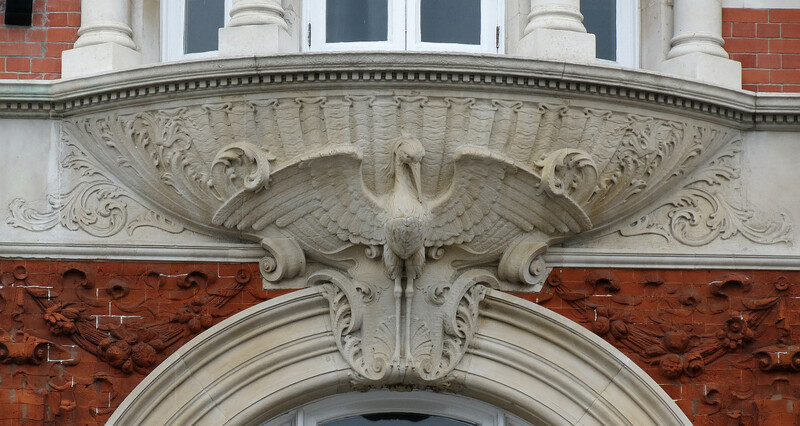 The bases of the protruding turrets to Tottenham Court Road are particularly lively, each bearing a stork with wings extended. 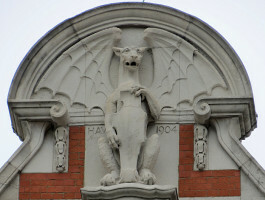 At the top of the gable, above a rose window, a heraldic dragon stands, holding a shield; the initials of the architect, H. A. W. and the date, 1904, are behind him. 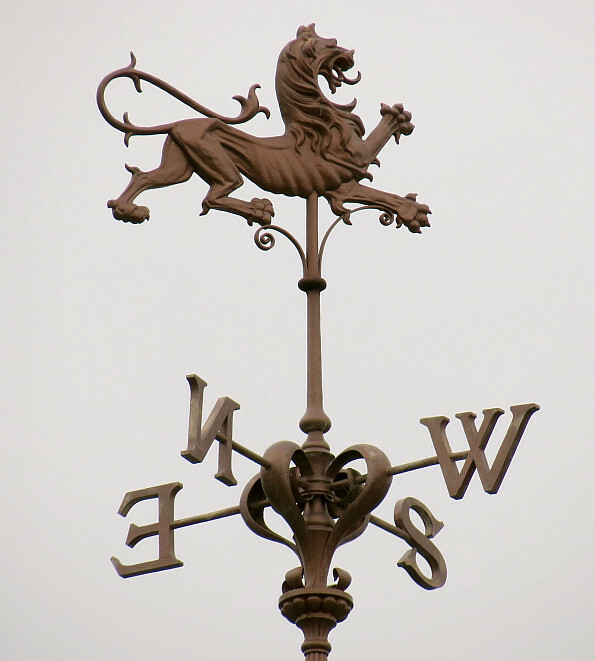 The architect was a certain Henry Alfred Whitburn. 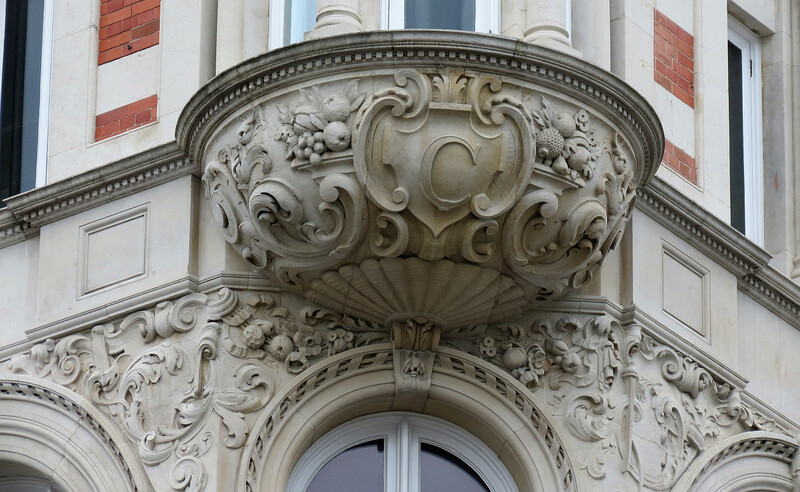 The base of the corner turret bears the initial ‘C’, for the name of the store, Catesby’s, who sold lino and carpets, and with a pub at the corner sight absorbed into the building. Statue of Minerva, Chenies Street . A door or two along, Nos. 69-71 and 75-77 are older remnants, becoming familiar to us by now, intersected by the purplish tile frontage to Goodge Street Station with a tall brick structure above. 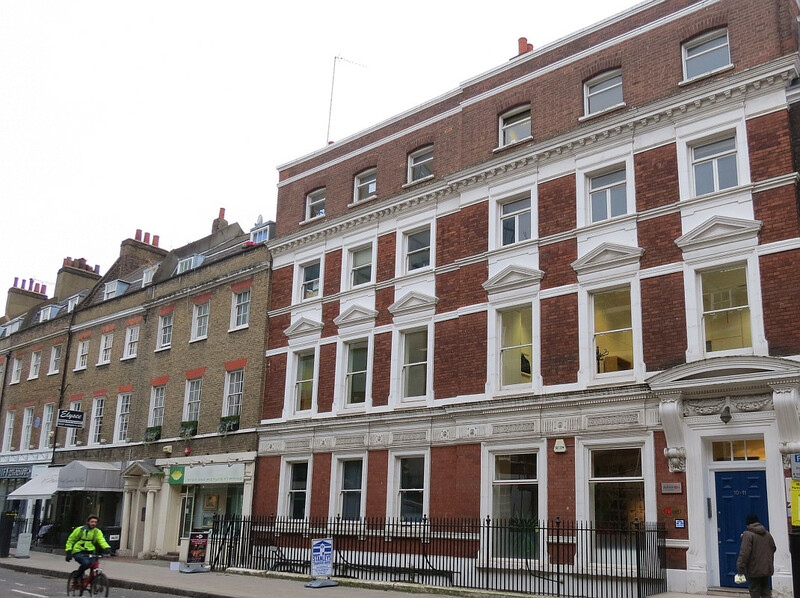 But before proceeding further we must cross over and go a few paces down Chenies Street, which opens out into a small crescent to the left with Minerva House in the central position, clad in white tile. It dates from just before WW1, and was put up for the Minerva Motor Company, a luxury Belgian car company, to the design of the architect George Vernon. 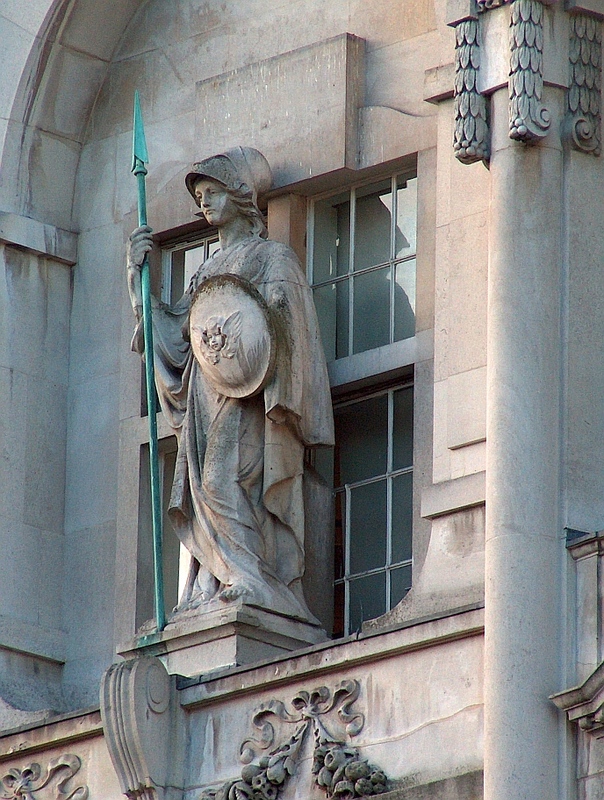 The statue of Minerva , rather high up, shows the Roman Goddess with spear, round shield baring a winged cherubic head, and raised helm rather like that of her Greek equivalent, Athena. Nice, bold carving to her drapery, but the face a slightly odd combination of solid neck, appropriate for a Classical female, with a face with marked 20th Century features, particularly the chin. Where George Whitfield preached, and John Bacon RA was buried . 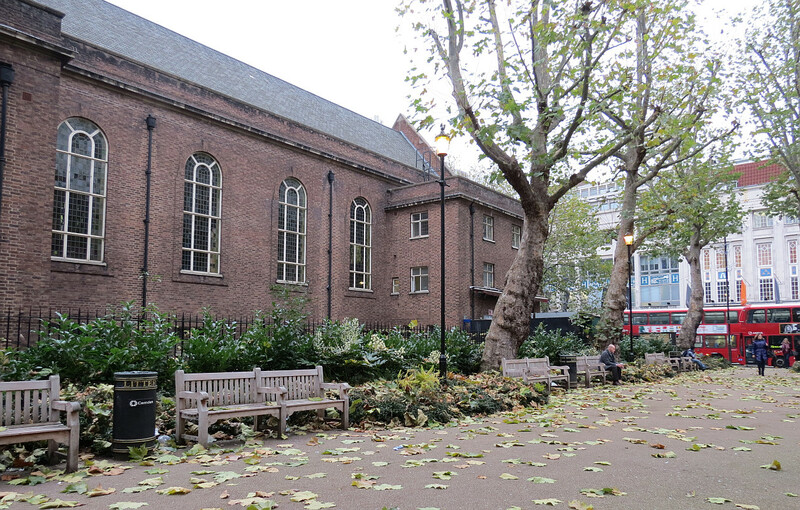 Back to Tottenham Court Road, where on the left hand side after Goodge Street Station past Chapel Street, a café in one of these older buildings, but standing quite on its own, is next to an open space and an American Chapel, more or less opposite the Heals building. Why here for an American church? It is the site of Whitfield’s Chapel , named after an evangelical preacher of the mid 18th Century, who afterwards died in America, in 1770. Alongside Whitfield’s memorial, the church contained the monument to John Bacon RA, d.1799, one of the more important sculptors of the period, along with the memorial tablet to his wife, Elizabeth Bacon, who had died in 1782. An octagonal building of some distinction, it was later replaced, and finally bombed in the Second World War, with the loss of all the monuments. The American church was built on the site. To the side, a small open area marks where the burial ground had been, until it became a public garden at the end of the 19th Century. The Heal’s building on the opposite side, bears low relief images of the wares sold by the famous furniture and interior décor store; the building dates from 1917 through to the 1930s. The part of the building now occupied by Habitat stands on the corner of Torrington Street, and before going down that street, we should mourn the loss of the Apollo and the Muses public house , which stood on the corner and was of sculptural significance. 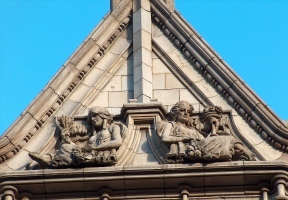 An extravagant work by the architect Charles Fitzroy Doll, put up in 1898, it was clad in Doulton Terra Cotta, and included free-standing statues of Apollo and all nine Muses. 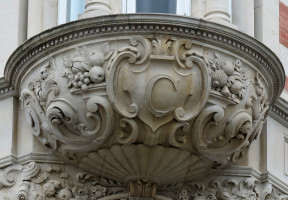 Some of these survived the demolition of the building by the Barbarians, and happily, one of them was presented to Camden and stands in St George’s Gardens, somewhat to the east of Tottenham Court Road. 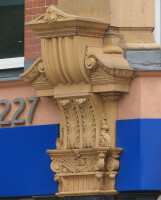 Fitzroy Doll's Torrington Street building, and details . 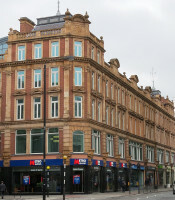 We have one surviving building to see, also by Fitzroy Doll, and very highly decorated, down Torrington Street. It is nos. 42-56 Torrington Street, on the south side, occupying the whole block down to Malet Street. 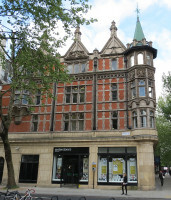 It is occupied by the Waterstones bookshop, previously for some considerable period the flagship of the Dillons bookshop chain, until it demised in the 1990s. We see corner towers, decorative sculpture including 6 pairs of reclining girls at rooftop height above dormer windows, with a further pair round each corner. 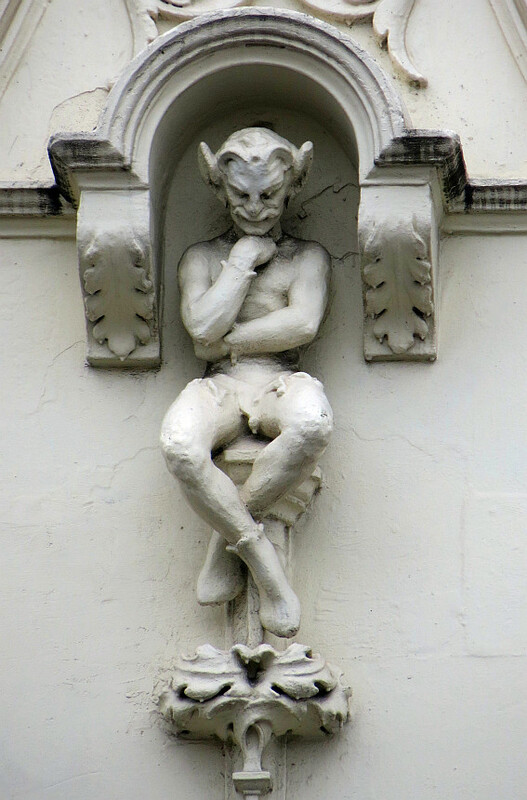 Gargoyles are on the drains lower down, coats of arms abound, and there is much carved florality on corbels and around the windows – excellent. 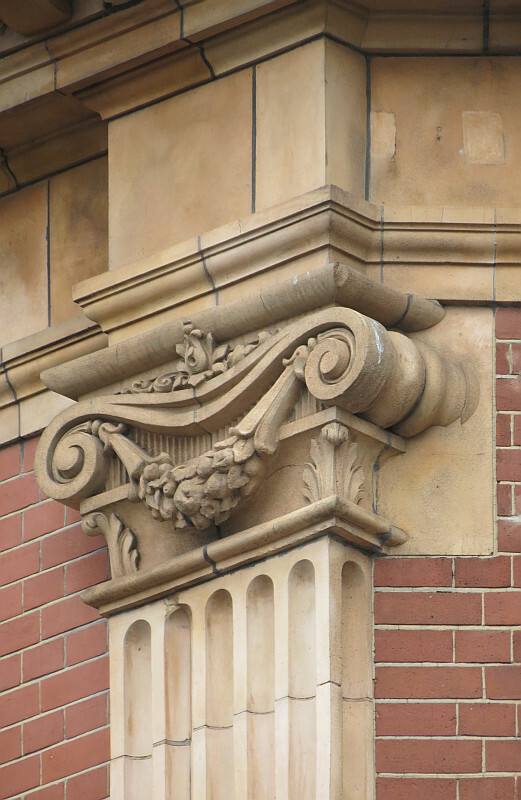 The date, on the corner masonry, is 1907, but the drainpipes are of 1908, which is the date we must ascribe to the completion of the building. We can end the walk there, back at Goodge Street Station, or proceed further up Tottenham Court Road, to see on the the right hand side along University Street the impressive bulk of Alfred Waterhouse’s University College Hospital. 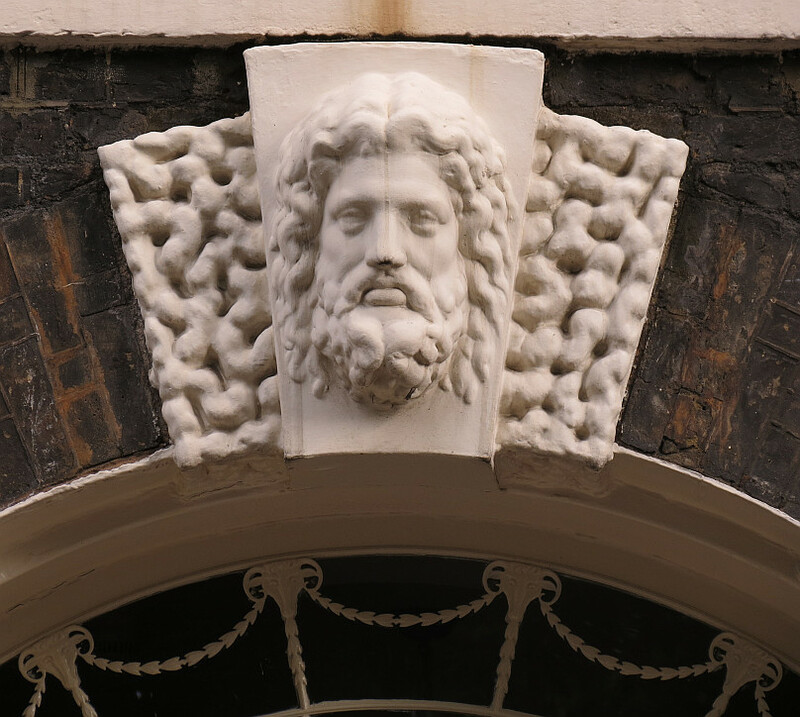 A bit further up on the left, Grafton Street and Warren Street contain more of the older terraces – a few with Coade Stone heads – and take us through to Fitzroy Square, subject of a short page of its own on this site. 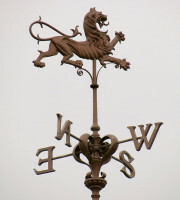 One of the weathervanes on Tottenham Court Road .